1. Create a new Workflow and save it with your full name EX5 e.g. Elliott Palmer EX5. 2. Drag and drop a 'GatorMail Group Entry', select the trainers group in the list e.g. Elliott - Workflow or Neil - Workflow. 1. Drag and drop a 'Campaign Journey' on to the canvas. 3. Click 'Add Campaign' and attach Gator Workflow One to Three to the journey. 2. Set the wait for 2 days. 3. Drag and drop a 'Go To Stage' on to the canvas. 4. 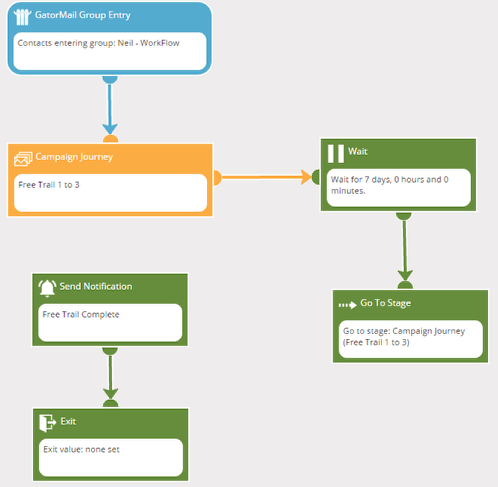 Select 'Campaign Journey (Free Trial 1 to 3) from the drop down menu. 1. Drag and drop a Notification stage on to the canvas. 3. Add in the email address you would like to be notified. 4. Add in a subject line for the notification email. 5. Add in your notification message, remember you can use contact fields as shown in this step. 7. 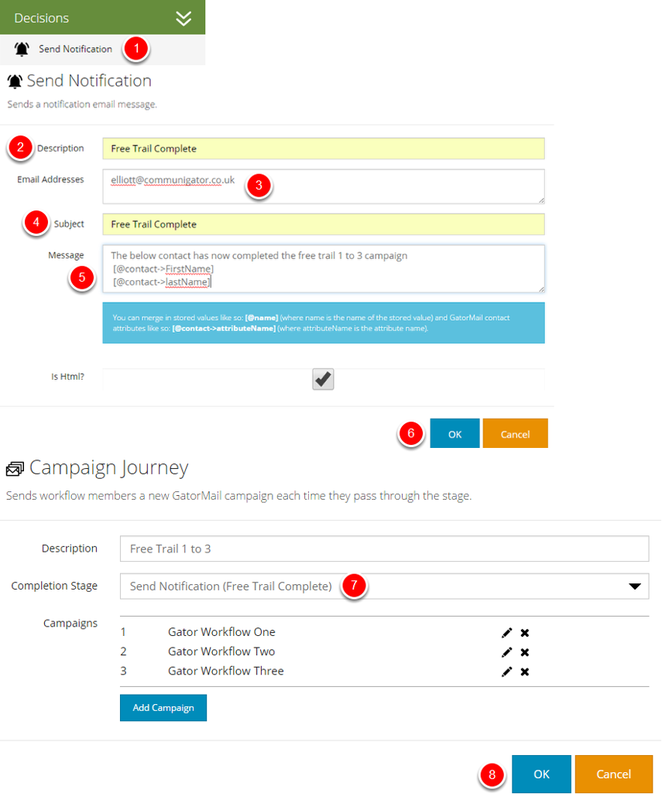 Return to the campaign journey and select 'Send Notification (Free Trail Complete)'. 9. Drag and drop an exit stage and connect to the notification.